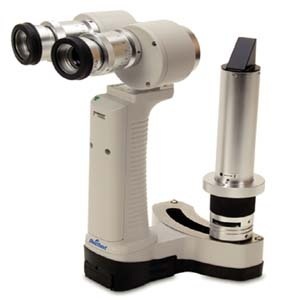 Reichert Slit Lamp - Dan Scott and Associates, Inc. 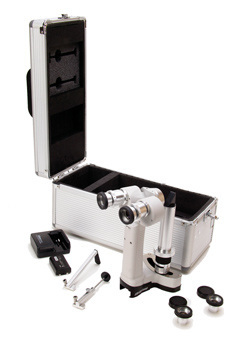 The PSL Slit Lamp weighs only about 1.5 lbs. (0.68 kg) with its battery and fits easily and comfortably in your hand. Its ergonomic, portable design and convenient carrying case make it an ideal instrument for non-ambulatory patients, nursing home visits, and veterinary work. The PSL’s high luminance light source provides about 10,000 lux of white light and has a lifespan of 50,000 hours or more; providing bright, consistent light, as well as the convenience of not having to replace bulbs. The PSL Portable Slit Lamp comes with two long-lasting batteries that can power the unit at maximum illumination for up to two hours. The PSL also comes with its own battery charger, allowing you to charge the batteries as necessary.